This site is intended to help collectors and dealers identify so-called dollars as listed in the major reference book So-Called Dollars by Harold E. Hibler and Charles V. Kappen. 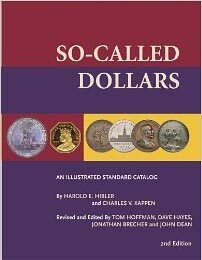 There are many unlisted varieties of so-called dollars that were unknown to Hibler and Kappen and to HK-research and listings by fellow collectors, they have been included within these pages whenever possible. More (and updated!) historical information. More listings including metal varieties and totally new items. Sizes are now listed in mm rather than by 16ths of an inch. Cross references to other major references are included. Part IV is now included into Parts I, II, and III. For the time being, the numbering has stayed the same. The printed book also contains rarity and pricing information, neither of which is available on this web site. Minimum diameter - Size 21 (1-5/16 inch or 33mm). Maximum diameter - Size 28 (1-3/4 inch or 45mm); but silver Bryan Dollars are listed. No holed or looped material unless struck plain also. Our Nos. 1 to HK-3 are the sole exceptions. No plastic, fiber or similar material unless issued also in one or more metals. No purely presidential or political medals. No school, college or athletic medals; no coin club or U.S. Armed Forces medals. No calendar or store cards; no trade tokens or emergency money. This site is supported by the publisher and copyright holder of So-Called Dollars by Hibler and Kappen, The Coin & Currency Institute.